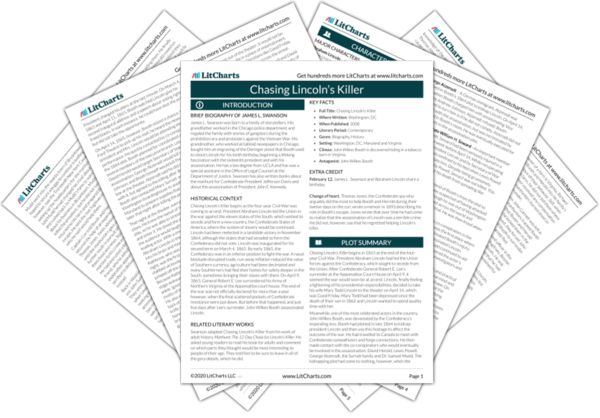 Instant downloads of all 946 LitChart PDFs (including Chasing Lincoln’s Killer). 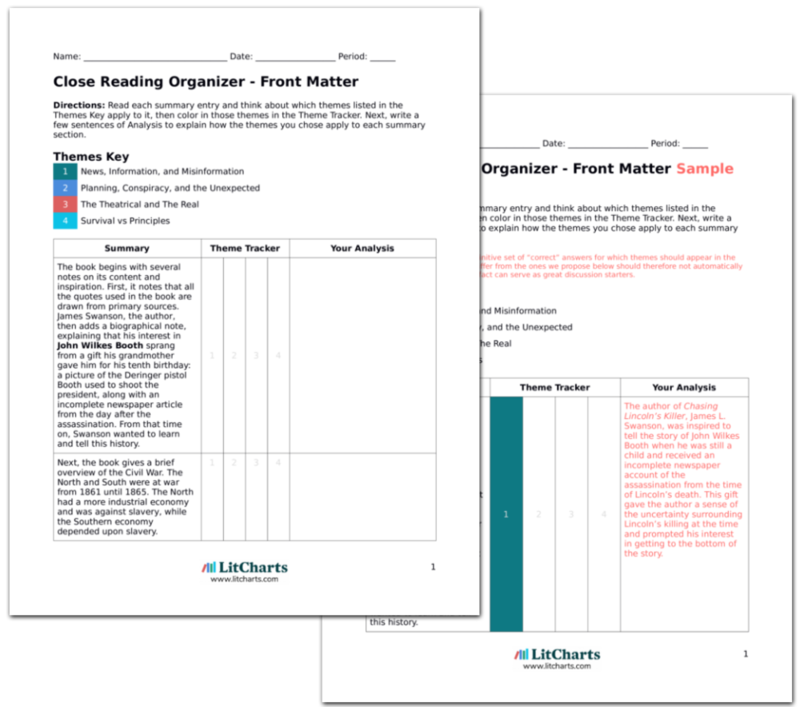 LitCharts assigns a color and icon to each theme in Chasing Lincoln’s Killer, which you can use to track the themes throughout the work. Booth likely watched from nearby as the Lincolns and their guests entered Ford’s Theatre. He went into the theater at 9:00 PM and listened to a few lines of dialogue to understand how far along the play was. Then he exited the theater and moved his horse from a stable to the back door of the theater, where an employee named John Peanut held the horse for him. Booth crossed the theater by climbing through a trapdoor and walking underneath the stage, and then exited onto Tenth Street. He went to the Star Saloon and drank whiskey, then returned to the theater. Booth followed the same path through the theater that the Lincolns had traversed, climbing a staircase up to the balcony. At the door of their box, he noticed with surprise that there was no guard, only a servant. Booth showed this servant something – perhaps a calling card with the famous actor’s name on it – and was allowed to enter the vestibule. Once inside, he saw that there was no guard outside the entrance to the president’s box. Booth prepared for his attack on the president by first walking through the theater and getting a sense of what was going on. He assessed both the physical space of the theater and how far along the play was. He also made sure that the president was, in fact, in attendance. Instead of creating a grand plan to kidnap the president (like he had before), Booth was now seizing the opportunity that chance provided him. He was also using his privileged position as an actor and the deep knowledge he had of the way the theater operated to his advantage. Booth also likely used his status as a famous actor to get Lincoln’s servant to allow him access to the presidential box. Inside the box, the Lincolns were enjoying a romantic moment. It was their happiest week in Washington. Lincoln took Mary Todd’s hand, and she pretended to be embarrassed; “what will Miss Harris think of my hanging on to you so?” she asked him teasingly, in the last exchange they would have while he was alive. “She won’t think anything about it,” her husband said. After years in which he had sent many men to die for principles, Lincoln was, for the first time, relaxing. On his last day alive, as the pressures of being a wartime president began to ease, Lincoln took the opportunity to draw closer to his wife and family. Booth entered the vestibule that led to the box and got into position. He found a piece of a music stand that he had stashed there earlier and wedged it between the wall and door so no one could enter the box after him. Inside the vestibule, he allowed his eyes to adjust to the darkness, peeking through a small hole bored in the door, which he may have created himself, when he visited the theater earlier that day to make his preparations. Inside the box, he saw that the president was seated closest to the door of the box. To Lincoln’s right sat Mrs. Lincoln, then Clara Harris and Major Rathbone. Booth readied his weapons as he awaited the moment when the actor Harry Hawk would speak the line that Booth knew elicited a loud burst of laughter from the audience. He hoped this laughter would drown out the sound of his pistol firing. Booth’s total access to the theater had given him the opportunity to quickly make important preparations for his attack on the president. No one in the theater thought anything of seeing Booth coming and going. This freedom to maneuver meant he could carefully stage the scene of the murder, getting his props ready in advance, just as an actor does before he steps onto stage. Booth’s knowledge of the play would allow him to try to shoot Lincoln at a moment when the loud sounds of the audience might cover the sound of a gun firing, blurring the distinction between the real and the theatrical. No one heard Booth enter the box; the Lincolns and their guests watched the play. Booth squeezed the trigger, and with an explosion of black powder charge and a flash of light from the muzzle, the bullet flew from Booth’s gun toward Lincoln’s head. Although Lincoln’s face was greatly aged by all the worry he had borne during the years of the war, had he only been wounded, he might have fought back against Booth. The president’s body was lean and strong. But instead, the bullet pierced the lower left of Lincoln’s skull and came to rest deep within his brain behind his right eye. Lincoln slumped forward. The sound of the shot hung in the box for a second, then traveled around the theater. Some in the audience were startled, others thought the shot was part of the play, and still others heard nothing at all. Booth’s plan to blur the theatrical and the real worked well. The president and his companions were focused on the action of the play and did not notice Booth’s entrance. After Booth shot the gun, the audience had difficulty discerning whether the loud sound was part of the play or not. At the same time, Lincoln’s body began its final struggle to hold onto life. Despite the president’s physical strength, which was hidden from many by the haggard look of his face, he had no chance of surviving the bullet wound to his brain. 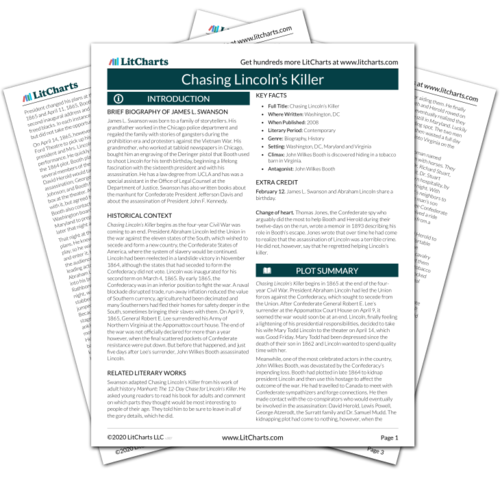 Get the entire Chasing Lincoln’s Killer LitChart as a printable PDF. Major Rathbone rose from his seat at the sound of the shot, stepping towards the president. He saw a man with a pale face, dressed in black, who sprang at him. Rathbone grabbed Booth’s coat, but Booth broke free, yelling “freedom!” and raising the knife in the air to stab Rathbone. Rathbone shielded himself in defense and the knife went deep into his arm, which gushed blood. Lincoln was unable to fight to protect himself, but Major Rathbone fought against Lincoln’s enemy, putting his own life in danger to stand up to whomever would attack the president. From this moment on, Booth became the primary target for all those who wished to defend the Union and Lincoln’s principles. While he fought off Rathbone trying to escape Ford’s Theater, Booth was literally stopped in his tracks by the symbols of American history and tradition: the flag and the portrait of America’s first president. He was also stopped by Rathbone, who acted as the living defender of these symbols and the principles they represented. When Booth finally escaped, it was onto the stage, where he used this familiar ground to shout out the principles motivating his actions. Levine, Yael. "Chasing Lincoln’s Killer Chapter 2." LitCharts. LitCharts LLC, 20 Feb 2017. Web. 25 Apr 2019. Levine, Yael. "Chasing Lincoln’s Killer Chapter 2." LitCharts LLC, February 20, 2017. Retrieved April 25, 2019. https://www.litcharts.com/lit/chasing-lincoln-s-killer/chapter-2.